2 July 1914: Entered the Army as a Fahnenjunker in the 2. Pommersches Ulanen-Regiment Nr.9. 15 February 1915: Sick/in hospital. 3 March 1915: Transferred to the Replacement Squadron of Ulan Regiment 9. 20 April 1915-20 May 1915: Detached to the Machinegun Course at Döberitz. 25 May 1915-13 September 1915: Detached to Kürassier-Regiment von Seydlitz (4. Magdeburgisches) Nr.7. 9 November 1915: Sick/in hospital. 3 January 1916: Transferred to the Replacement Squadron of Ulan Regiment 9. 10 January 1916: Returned to the regiment in the field. 10 May 1917-22 June 1917: Detached to the Machinegun Weapons Master Course at Spandau. 3 July 1918: Squadron Chief in Ulan Regiment 9. 13 October 1918: Wounded/in hospital. 28 December 1918: Transferred back to Ulan Regiment 9. 31 May 1919: Transferred to Reichswehr Cavalry Regiment 2 of Reichswehr-Brigade 2. 7 October 1919-15 November 1919: Detached for instruction to the Firing School at Wünsdorf. 11 November 1919: Transferred to Reichswehr Cavalry Regiment 102 of Reichswehr-Brigade 2. 29 March 1920: Transferred to Reichswehr Cavalry Regiment 6 of Reichswehr-Brigade 6. 1 October 1924: Transferred to the regimental staff of the 6th (Prussian) Reiter-[Mounted] Regiment, Pasewalk. 10 January 1925: Regimental Adjutant of the 6th (Prussian) Reiter-Regiment, Pasewalk. 1 October 1928: Chief of the 2nd Squadron of the 8th (Prussian) Reiter-Regiment, Oels. 1 June 1931: Garrison Senior in Brieg. 1 December 1933: Adjutant of the 1st Cavalry Division, Fankfurt am Oder. 15 October 1935: Transferred to the 3rd Inspectorate of the Reich War Ministry. 12 November 1938: Commander of the II. Battalion of Cavalry Regiment 6. 30 September 1941: Commander of the 1st Reiter-Brigade of the 1st Cavalry Division. 31 October 1942: Army High Command Leader Reserve. 12 May 1943: Captured by the British at Gombalia in Tunisia. 12 May 1943-7 October 1947: Prisoner of war in British captivity. 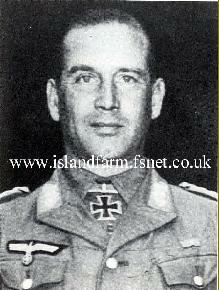 Knight’s Cross of the Iron Cross: 29 August 1942, Oberst, Commander of the 24th Panzer Grenadier Brigade. German Cross in Gold: 2 November 1941, Oberst, Commander of Reiter-Regiment 22. Atkinson, Rick. An Army at Dawn: The War in North Africa, 1942-1943. Henry Holt and Company, Inc., New York, New York, 2002. Bender, Roger James & Law, Richard D. Uniforms, Organization and History of the Afrika Korps. R. James Bender Publishing, San Jose, California, USA, 1973 (1st Edition). Hoffmann, Peter. Stauffenberg: A Family History, 1905-1944. McGill-Queen's University Press, Canada, 2003 (Second Edition) (originally published in Germany in 1992 as Claus Schenk Graf von Stauffenberg und seine Brüder). Of note, then Oberst Fridolin von Senger und Etterlin commanded the 1st Cavalry Division’s 2nd Reiter-Brigade from February-May 1940. Following combat in the Netherlands, his command was reorganized as an independent motorized brigade for employment with the panzer divisions during the second phase of the invasion of France. Brigade “Senger” then took part in the breakthrough of the Weygand Line in France and, while subordinated to Generalmajor Erwin Rommel’s 7th Panzer Division, participated in the capture of Le Havre and Cherbourg. From early 1946 until his release in May 1948, General der Panzertruppe Fridolin von Senger und Etterlin was held as a prisoner of war at Island Farm Special Camp 11. Then General der Infanterie Erich von Lewenski genannt von Manstein commanded the XXXVIII Army Corps during the invasion of France in 1940. Attaining the rank of Generalfeldmarschall, he was held for a time as a prisoner of war at Island Farm Special Camp 11 after the war. Upon Generalmajor Hasso von Mateuffel’s assumption of command, the unit was renamed Division “von Manteuffel.” Achieving the rank of General der Panzertruppe, von Manteuffel was held for a time as a prisoner of war at Island Farm Special Camp 11 after the war. The previous commander of the 10th Panzer Division, Generalleutnant Wolfgang Fischer, was killed on 1 February 1943 when his staff car ran over a mine. Traveling with Fischer, Oberstleutnant Wilhelm Bürklin, the divisional operations officer (Ia), was also wounded. On 14 February 1943, Oberstleutnant Claus Schenk Graf von Stauffenberg, recently arrived from Germany, assumed duties as the new operations officer of the 10th Panzer Division. Stauffenberg’s service in North Africa came to an abrupt end when he was badly wounded in an air attack on 7 April 1943. The severity of the wounds required the amputation of his right hand, two fingers from his left hand and the removal of his left eye. The key member of the “July Plot” to assassinate Hitler, Stauffenberg planted a bomb at Hitler’s military headquarters near Rastenburg on 20 July 1944. As history records, Hitler survived the assassination attempt and wreaked a terrible vengeance on the conspirators. Stauffenberg was executed by firing squad in Berlin on the night of the assassination attempt upon the orders of his superior, Generaloberst Friedrich Fromm. Aware of the plot but uncertain of whether or not he should become directly involved, Fromm had hoped to cover his tracks by executing Stauffenberg before he could be implicated. However, Fromm was arrested shortly afterwards and tried and executed on 12 March 1945. Colonel Alexander N. Stark, Jr., the commander of the 26th Infantry Regiment (U.S. 1st Infantry Division), led Task Force Stark during the Battle of Kasserine Pass. In the aftermath of the battle, Colonel Stark was among many U.S. officers relieved of command, the most senior of which was Major General Lloyd R. Fredendall, the commander of the U.S. II Corps. Lieutenant General George S. Patton, Jr. succeeded Fredendall as the corps commander. Lieutenant General George S. Patton, Jr., the commander of the U.S. II Corps, observed the pounding of the 10th Panzer Division at the Battle of El Guettar and commented: “My God, it seems a crime to murder good infantry like that.” This battle was vividly portrayed in the 1970 motion picture Patton starring George C. Scott.